By the time secret service agents led U.S. Secretary of Energy Samuel W. Bodman ScD ’65 into the Stata Center’s Kirsch Auditorium on Tuesday, a packed house sat waiting to hear him speak about America’s energy future. The talk was sponsored in part by the Energy Research Council and followed the release of the council’s initial report last week. In his talk and in the following question and answer session, Bodman, a former associate professor in chemical engineering at MIT, highlighted proposed federal budget increases to several energy research areas, including solar and wind energy, clean coal, and efficient hybrid vehicles, but the two topics that received the most attention were nuclear energy and cellulosic ethanol. Another new nuclear thrust discussed by Bodman was Bush’s new Global Nuclear Energy Partnership, an international effort to develop responsible management of nuclear waste through advanced reprocessing technology. This technology relies on advanced burner reactors, which can use fast neutrons to consume and eliminate elements which are otherwise removed from today’s reactors as waste. These advanced reactors produce more electricity and less nuclear waste than current technology. The GNEP arrangement “carries the potential to allow poorer nations to leapfrog over some of the dirtiest … fossil fuel-based technologies,” he said. GNEP is set to begin in fiscal year 2007, Bodman said, pending Congress’s approval of an initial $250 million of funding. By 2026, cellulosic ethanol could account for as much as a quarter of America’s transportation fuels usage. While most ethanol is currently formed from corn, cellulosic ethanol is derived from feedstocks such as wood chips, prairie switchgrass, or the leftover leaves and stalks of corn plants, all of which are more abundant than corn grain. Today, ethanol comprises less than 5 percent of U.S. fuel use, partially because this year’s national ethanol production — at 5.6 billion gallons — comes from corn. Last year, about 14 percent of the nation’s corn crop went into ethanol, Bodman said, but reliance on corn could lead to economic disturbance of food markets. Nuclear energy and cellulosic ethanol highlight the short-term focus that Bodman is bringing to the Department of Energy. In response to a question on the long-term potential of nuclear fusion, for example, as an energy source, Bodman said that he was trying to foster a “let’s get some things done” attitude at the department, which contrasted with the abundance of research projects that “seemed to have no end” in the department when he took office in 2005. Bodman cited the ongoing construction of a coherent x-ray light source at the Stanford Linear Accelerator Center, an increased investment in microbial research, and the creation of five nanoscale science research centers at DOE labs around the country as examples of the department’s commitment to basic science. Also touted by the Secretary of Energy were several new initiatives on energy from the Bush administration. One, the American Competitiveness Initiative — a “watershed for American science and engineering,” would fund not only breakthroughs in research, but also the education of future scientists and engineers at the elementary and high school levels, he said. Bodman also repeatedly and candidly acknowledged the political realities he faces in Washington. Several times he mentioned that his department’s overall budget has been flat and openly stated that certain energy policies that are widely favored by analysts, such as raising national fuel taxes, are simply politically untenable. 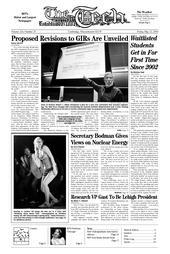 The President has committed to doubling the budget of the DOE’s Office of Science over the next 10 years, Bodman said, as part of Bush’s Advanced Energy Initiative. For fiscal year 2007, this office’s budget would expand 14 percent, from $3.6 billion to $4.1 billion, he said. These expanded funds could support 2,600 new energy researchers in 2007. Bodman paralleled the national security, public health, and competitiveness challenges of today to the times of his youth. “I was a product of the Sputnik generation,” which was a “time of fear,” that led to not only the space race but a massive increase National Science Foundation funding, he said. Sputnik and fear of Russian dominance led America to recognize that its economic preeminence required substantial and sustained investment in science and technology. That investment must continue today, said Bodman, saying that “this government is committed to holding up our end of the bargain” to scientists and engineers. Bodman singled out MIT at several points in his lecture. He congratulated the Institute on its recent selection to participate in the DOE’s Solar Decathlon, which involves the design and construction of solar-powered, energy-efficient houses on the Mall in Washington, DC.